Born in Kishanganj, Bihar–a small town in India–Zafar has studied at some of India’s prestigious educational institutions such as the Indian Institute of Mass Communications (Delhi), Jawaharlal Nehru University (where he dropped out of a Masters programme) and Aligarh Muslim University. He also has a certification in Screenplay Writing from the University of the Arts, London. Zafar has been a journalist and writer for over 19 years. As a journalist, Zafar worked as the Online Editor at Executive Networks Media, Singapore, leading the editorial team (online) for enterprise IT publications such as Computerworld Singapore, Computerworld Malaysia, CIO Asia and MIS Asia. Previously, Zafar worked with media companies such as Fairfax Business Media (Australia), MediaCorp (Singapore) and Encyclopaedia Britannica (India). Zafar is the author of Kafka in Ayodhya and Other Short Stories (Kitaab, 2015), Startup Capitals : Discovering the Global Hotspots of Innovation (Random House India, December 2014), Iqbal: The Life of a Poet, Philosopher and Politician (Random House India, 2014), the bestselling business book, The Resurgence of Satyam (Random House India, 2012), a collection of short stories, The Singapore Decalogue: Episodes in the Life of a Foreign Talent (Red Wheelbarrow Books, Singapore, 2012), and a collection of essays, Kafka and Orwell on China (Samshwords, 2011). In 2013, he translated and published a book on Urdu poetry (Urdu Poetry–An Introduction, Kitaab). His early literary efforts include a novel, Of Seminal Fluids (Time Books, 2000) and a volume of translated poetry, My Silence Speaks (Spree, 2001). For Singapore Decalogue, he received the 2010 Arts Creation Fund grant from the National Arts Council, Singapore. 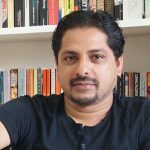 Zafar started his writing journey in 2002 when one of his short stories, The Rats, won him an invitation to the Conference of New South Asian Creative and Academic Writers held in Colombo, Sri Lanka. The conference was organized by the British Council, Sri Lanka. He was further encouraged as a writer when his story, Waiting for the Angels, was shortlisted for the TLM New Writing Prize 2006 by The Little Magazine, India. Some of his Singapore short stories appear in Love and Lust in Singapore, The Best of Southeast Asian Erotica and Crime Scene: Singapore, all published by Monsoon Books, Singapore. His second novel (Murder in Clivesganj), a work-in-progress, was excerpted in the Indian Literature, a literary journal published by the Sahitya Akademi, New Delhi (India’s National Academy of Letters). As a commentator, Zafar has been published in The South China Morning Post (Hong Kong), The Hindustan Times (India), The Times of India (India), Tehelka (India), The Pioneer (India), Outlook (India), Mainstream (India), China Daily (China), The Little Magazine (India), Guernica (USA), Little India (USA), Today (Singapore), India Se (Singapore), The Bangkok Post (Thailand), Jakarta Globe (Indonesia), Malaysiakini.com (Malaysia), Small Spiral Notebook (US), Jamini (Bangladesh) and The Six Seasons Review (Bangladesh), among others. Zafar also makes short films and documentaries and has so far scripted two feature films (one of them was commissioned). He is a member of the Screenwriters Association (Singapore). He is the founder-editor of Kitaab, an online journal as well as a publishing company dedicated to promoting Asian writing in English. In the same spirit, he has also mentored Singapore’s gifted students under the Ministry of Education’s Creative Arts Programme (CAP).